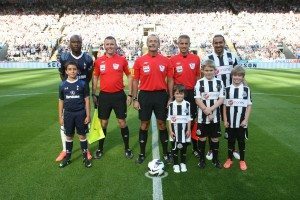 Want to give a young Newcastle United fan an unforgettable match day experience and help raise money for charity? Newcastle United Foundation is offering 11 exclusive Mascot Experiences for Newcastle United’s Europa League qualifier against Atromitos FC on Thursday 30th August 2012 (kick off 20:00) where your son or daughter could experience the thrill of a lifetime by running out onto the pitch with their heroes. Places for this one-off experience are available for £325 and all proceeds go to Newcastle United Foundation (Registered Charity Number 1124896). There are only a limited number of places available for this amazing experience. To book or for more information call the Foundation on 0844 372 1892, choose option 4, x 8451 or email [email protected] by Monday 27 August. *The experience is open to girls and boys aged five to 14 but to qualify for ball boy duty girls and boys must be aged 10 to 14 for health and safety reasons. If child is not old enough for ball boy place, a child ticket for game will be given. Mascots will need to be at the stadium for 6.30pm.